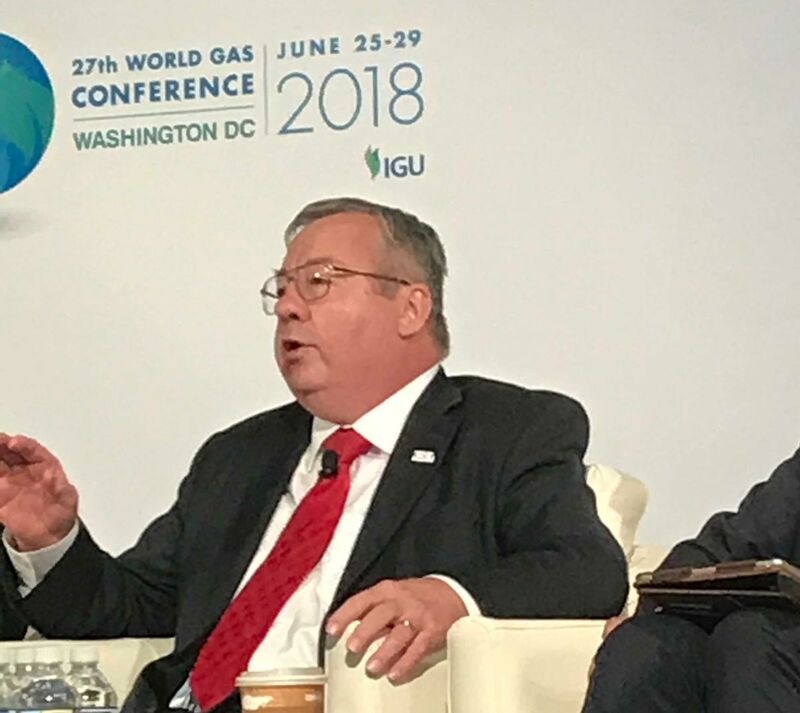 Washington, D.C.— On Friday, U.S. Energy Association Executive Director Barry Worthington told the World Gas Conference 2018 natural gas production is booming and supplies are abundant, but the U.S. still needs more pipelines and export infrastructure. The panel, Regional Challenges and Opportunities in the Americas, moderated by Dr. Neil Parsan, former ambassador to Trinidad & Tobago, now managing director of Parsan Cross, and Hector Castro Vizcarra, Minister for Energy Affairs at the Embassy of Mexico in Washington, included: Victor Carlos Urrutia Guardia, Panama’s Secretary of its National Secretariat of Energy; Mark Loquan, President of the National Gas Company of Trinidad & Tobago; and, Salvador Escobedo, President & CEO of Pemex Procurement International. The group agreed that natural gas supplies in the region are ample, and desire to bring more natural gas to market exists, but so do hurdles—more frequent and powerful hurricanes that threaten infrastructure, natural gas delivery logistics, transportation and economics. Many of the countries in the Caribbean, Central and South America face financial constraints that prevent infrastructure improvement. Loquan said few of the countries have more than 1000 MW of power, and most have less than 100 MW. Worthington said the U.S. is expected to play a larger role in the region. USEA helps expand energy infrastructure with the U.S. Agency for International Development and has worked in 75 countries on energy cooperation and development. Since Cheniere’s LNG export facility, Sabine Pass, became operational in 2016, the company has shipped 350 cargoes of LNG to 28 countries, including China, through the Panama Canal. In April 2018, for the first time, three LNG cargo ships went through the Panama Canal. Both the Energy Department and the Federal Energy Regulatory Commission have worked to streamline the permitting process, which has changed the trajectory of the natural gas sector and propelled the U.S. energy industry. “In the past year, 30 percent of U.S. LNG has been exported to South America, Mexico and the Dominican Republic. America is now the largest gas producer in the world, and we believe we are on our way to becoming the world’s leading LNG exporter,” Worthington said. “More than a billion people across the globe have inadequate access to energy. We expect American natural gas, but also coal, crude oil and refined petroleum products will help meet a growing global energy demand and reduce energy poverty.